Life can be tough. 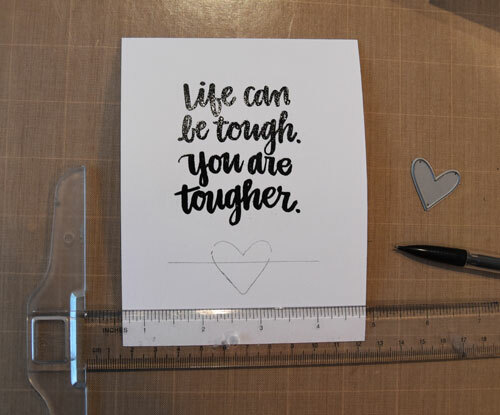 You are tougher. Hi everyone. 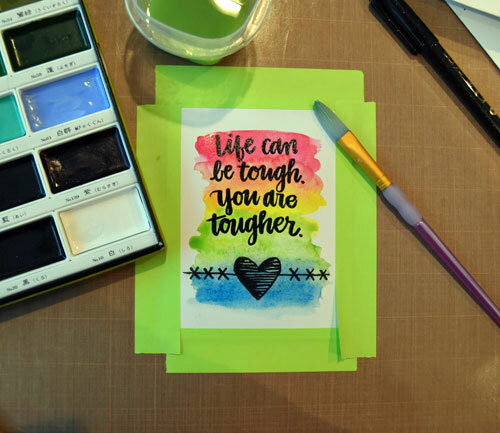 I have a friend in need of a little encouragement so I thought I’d create a card just for her today. 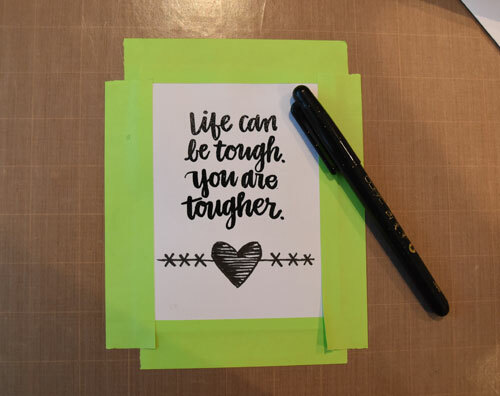 A while back, I bought Hand Lettered Encouragement by Simon Says Stamp for this sentiment alone. The others are wonderful as well, but I especially love this one. 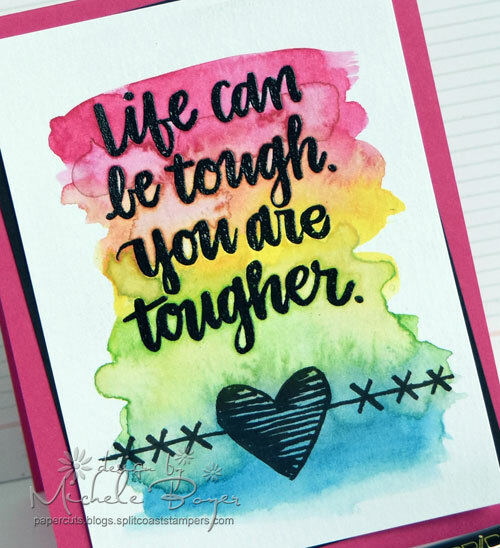 Since I wanted to emboss the sentiment, I first used a powder tool over watercolor card stock to prevent any stray specks of embossing powder from sticking where I didn’t want them. I stamped using VersaMark ink then heat embossed with black embossing powder. I used a t-square to draw a straight line then traced a heart die in the center. Once I was satisfied with the design, I used my Kuretake Gansai Tambi watercolors to color over the stamp and pen work. The pigment ink of the pen did not bleed at all. It’s Copic marker compatible as well. You can read more about it HERE and/or purchase HERE. Once dried, I decided to add a bit more water to the design to create more of an uneven look. Life’s events can be crazy so I decided my watercolor here should be as well. This entry was posted in Copic, My Designs, Simon Says Stamp. Bookmark the permalink. Beautiful card, your friend will love it! 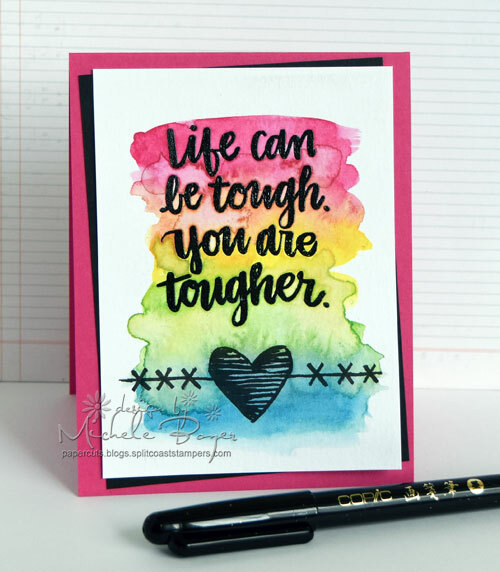 Love the sentiment and the watercoloring! Love the look of the card and the message. for sharing how you made it. I love the colors you have used on your card. The sentiment is so inspiring and uplifting!